Could this be another example of online advertising presaging the onset of a hardware upgrade from Cupertino? 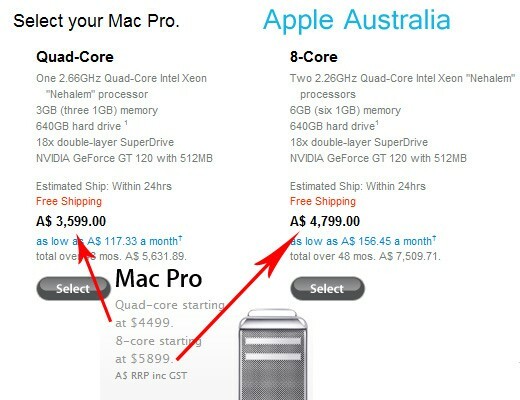 Apple's ads on Australian tech pub PC Authority have been spotted displaying some rather peculiar price tags for its flagship mobile and desktop computers. Whereas Cupertino's Aussie online store lists the most affordable versions of the MacBook Pro, MacBook Air and Mac Pro at A$1,599, A$1,999 and A$3,599, respectively, the above, official-looking ads would seem to disagree. Clicking on them still leads to the currently priced (and specced) machines, but looking at them suggests that -- in the absence of some major conspiracy or a splendidly random price hike -- we're getting an early peek at the pricing of the newly updated models of each of those series. The MacBook Air has jumped by A$400 so that what used to be its costliest base price is now its lowest, while the MBP has suffered a A$300 bump in cost of entry. Then again, considering the expectation that the mobile computers will get Core i7 CPUs while the Mac Pro will get all dressed up with Core i7-980X regalia, this development is perhaps not all that surprising. The major thing to take away here is that the long-awaited upgrades might finally be arriving. We're putting our piggy banks on alert, just in case. Update: We've come across some other pricing inconsistencies contained within Apple's own New Zealand site. Find out what's happening after the break [Thanks, ScottNYC]. Update 2: The prices above have been corroborated by Apple's Australia site, which now suffers from the same schizophrenic pricing as its New Zealand compatriot. You'll find screenshot evidence after the break. Looking at the Mac Pro page on the Apple New Zealand site, we get a small blurb indicating prices of $5599 and $7299 in NZ currency for the quad- and eight-core options, respectively. But then sliding along to the purchase page we see significantly lower prices prominently displayed. You can see in the image below that the same situation is apparent on the Australian version of the Mac Pro site as well. 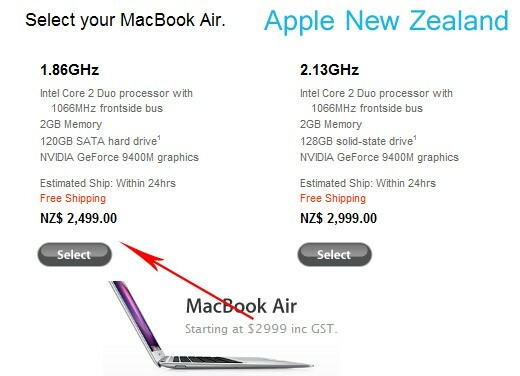 We're not too fresh on Apple's pricing policy in Oceania, but clearly something is afoot, as a similar inconsistency can be found with the MacBook Air prices. Starting prices of both NZ$2,499 and NZ$2,999 are being paraded in the second of our images. We could, quite easily, be looking at a good old fashioned snafu here, making an anthill out of a mountain or whatever, but we thought you'd care to know.